Learn English in Cork at our partner school, ACET (formerly known as The Cork Language Centre). The school is located in two adjacent Georgian buildings which have been renovated while keeping their elegant 18th century character. The school is centrally located, meaning everything you may want is located within walking distance of the school. Besides light and comfortable classrooms and other facilities to aid you in your studies, the school also has a pleasant garden where you can relax with other students between and after your classes. The intensive course consists of 20 or 26 lessons per week (1 lesson = 55 min) in a group with a maximum of 15 participants. The small number of students per class ensures effective teaching with the flexibility to meet your individual needs, in a comfortable and friendly atmosphere. You have a progress test and a personal tutorial with your principal teacher each week. The intensive courses have a cultural component, which helps you to learn about Irish culture and the Irish way of life. The intensive course focuses on practical communication skills with the emphasis on speaking and listening. Reading and writing activities provide you with opportunities to interact with other students. Vocabulary, idioms and grammar are practised in interesting and stimulating ways to achieve fluency. The 6 additional lessons (intensive 26 course) focus on English for daily use. These classes are especially designed to help you improve your practical use of the English language. Homestay accommodation includes half board on week days and full board at weekends (a light lunch). Students staying in a host family during the Christmas period, need to pay a € 100 surcharge per week since meals are based on full board during this period. Summer residence is open from 01/06/2019 to 17/08/2019. The price stated here is for an airport transfer on arrival when staying in the residence (the transfer is included when staying in a host family, for arrival between 09.00 - 22.30 hours). The maximum waiting time in case of delay is 30 minutes. Teaching materials are not included (1 book per level, approx 4 weeks € 50 per book). The combined course includes 20 lessons of the intensive course supplemented with 5 lessons of individual tuition per week. You will attend the regular 20 lessons in groups of up to 14 students. After lunch you will have a lesson of private tuition also, however. During these lessons you can address your specific needs and they will help you learn faster. Your teacher focuses on your particular needs and objectives, so you can jointly come up with the lessons that best suit you. This course combines the intensive course of 20 lessons with 4 lessons of exam preparation. The IELTS preparation lessons are on Tuesday and Thursday afternoons (02:10-4:00 PM). The average number of students per class is 8-10 (max. 14). The exam fees are not included and depend on the level of the exam. A minimum level of intermediate (B1/2) is required. It may be necessary to book an extra night of accommodation at the end of the course due to the exam date (prices on request). This course combines the intensive course of 20 lessons with 4 lessons of exam preparation. The TOEFL preparation lessons are on Tuesday and Thursday afternoons. The average number of students per class is 8-10 (max. 14). The TOEFL test is a recognised measure of your English language level and a high score is needed when you apply to attend a university or college. The test has four components: listening comprehension, structure, reading and writing. The TOEFL test in Ireland is computer-based. Minimum level: intermediate. It may be necessary to book an extra night of accommodation at the end of the course due to the exam date. Prices on request. This course combines the intensive course of 20 lessons with 4 lessons of exam preparation. The TOEIC preparation lessons are on Tuesday and Thursday afternoons. The average number of students per class is 8-10 (max. 14). The TOEIC examination tests your English proficiency in an international working environment and is useful if you wish to work for multinational companies. Businesses, government agencies and other public and private organisations accept TOEIC scores as proof of English skills in professional communication. The test has 2 components: listening and reading. The exam can be taken at school. To read more about the TOEIC examination course please click here. This course prepares you for the Cambridge Exam FCE or CAE. The Cambridge Preparation Course consists of 20 lessons per week and is designed to prepare you for the five components of the examinations (reading, writing, grammar, listening and speaking). Prior to arrival, you do a pre-test so that you can make an informed decision on which examination course to join. All teachers are experienced Cambridge examiners with many years of experience in examination preparation. You benefit from a combination of examination techniques and general language study. Please note: The 4 week course starting in July includes 3 weeks + 2 days tuition while the 4 week course starting in August includes 3 weeks + 3 days tuition. The 10 week course includes 9 weeks + 4 days tuition. In case of booking accommodation through us, your accommodation will be booked for the whole amount of weeks. The exam fees are not included and depend on the level of the exam (between € 185 and € 205). With many Cambridge courses, it is necessary to book an extra night or week of accommodation at the end of the course due to the exam date (prices on request). This course prepares you for the Cambridge Exam CPE. The Cambridge Preparation Course consists of 20 lessons per week and is designed to prepare you for the five components of the examinations (reading, writing, grammar, listening and speaking). Please note: The 10 week course starting in September 2019 includes 9 weeks + 3 days tuition but includes 10 weeks of accommodation if booked. Due to the exam date it might be necessary to book additional nights of your accommodation (prices on request). The exam fees are not included in the price (€ 205). The business English course is designed for professionals (min age 23) who wish to achieve maximum progress in a short amount of time. The course focuses on the essential language skills to perform in today’s competitive and global environment. Classes are in small international groups with max. 6 participants and you can have lunch with the tutor (cost of lunch is not included). 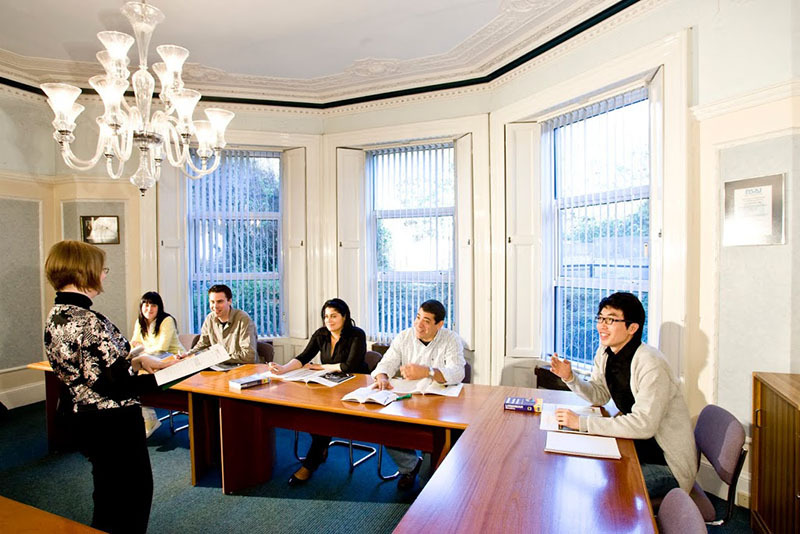 Components of the business English course include conducting meetings and discussions, making presentations, dealing with facts and figures, interviewing, negotiating techniques, management styles and leadership, describing trends as well as choice of stimulating topics such as sales and marketing, human resources, quality management and cross-cultural issues. It is a highly interactive course. The Business English course consists of 25 lessons per week, and 5 hours lunch time with a teacher (lunch not included in the prices). Minimum age is 23 years . The Business English course requires an intermediate level of English and a minimum age of 23. The course provides a balanced programme of methodology, classroom resourcing, current theory, cultural exposure and language enrichment. As a teacher of English, you can expect a challenging learning experience which updates and refreshes your teaching. The afternoon sessions complement the academic component of the programme. Through a series of visits to places of historical interest as well as lectures and workshops, you gain an overview of the culture, the history and the education system of Ireland. This is a Cambridge exam specifically aimed for Teachers of English as a second language. TKT certification is suitable for those non-native teachers who would like to teach English as a second language. During the lessons, participants will be prepared for the TKT exam and will increase the knowledge of concepts related to language and its use. This a module especially focussed on non-native teachers (not necessarily teachers of English as a second language) who teach their subject in the English language. During the lessons, participants will increase their communication skills in English as well as they will explore keys issues and methodology forms. Parents can attend a course of 20 lessons a week from 9:00-12:55 am from Monday to Friday. Groups are of max. 14 students so that you can fully benefit from the lessons. The language school is located in the city center of Cork. The prices indicated are for the course only. If you wish to book a private accommodation for your family, please contact us to receive a price quotation. Apartments are only available in July and have very limited availability! The family course for children takes place at the University College Cork. Thanks to its excellent facilities (student dining room, indoor pool, gym, tennis / football courts and running tracks), it is an excellent place for young people to enjoy their holidays while learning English. Classes take place from 9.30 to 12.30. The prices indicated include only the cost of the courses. The program of activities (in the afternoon), accommodation (for the whole family) are available by a supplement. To receive exact prices, please contact us. For students between 5-10 years old, an "activity camp" can be booked. Infants from 1-4 can be accommodated in the kindergarten. Prices and information on request. Prices for the family course are for the course only and do not include accommodation. Prices for family apartments on request (please contact us for more information). Under 11 years old can book a "Activity Camp" (5-11 year olds) (prices on request). Children aged 1-4 years old can be placed at the Junior Creche (prices on request). The Golden Age Course in Cork is specially designed for those students of 50+ who are interested in a combination of English language and culture. This programme is highly recommended to learn the language by having great fun and discover Ireland and in particular, Cork and its culture. The Golden Age course very flexible and aims to suit the needs and interest of the group. The English course is focussed on developing communication skills both inside and outside the classroom. The learning ambience is great and all the participants will be encouraged to increase the vocabulary and language through real communicative situations. A minimum level of intermediate is required to participate in this course. The one-to-one course offers the most rapid, relevant and cost-effective form of language training. Your tutors can focus on general English or on the language skill you require for your profession or studies. 15 or 20 hours per week. If you want a different number of hours per week, please contact us. Homestay accommodation is ideal for you if you wish to immerse yourself in the unique culture of Ireland. Living in an Irish home is an excellent way of improving your English and experiencing everyday life in Ireland in a welcoming and supportive environment. You stay in a good residential area of Cork, close to a bus route. You live in a home the school has selected on the basis of a warm friendly atmosphere and clean comfortable surroundings. You are accommodated on a half board basis from Monday to Friday and on a full board basis at the weekend. To ensure that you practise English, you will be the only speaker of your mother tongue placed in your homestay. The summer residences University Place, Victoria Mills Apartments and Victoria Lodge are located at approximately 30 minutes walking distance or 10 minutes by bus from the language school and are available from June to August. You will have a single room with a private bathroom in an apartment you will share with other students. The apartments consist from 3 to 7 rooms and each apartment has a fully-equipped kitchen (with microwave, dishwasher, fridge, electric hob) and a living room with a television. Bed linen is supplied but you must bring your own towels. The apartments are situated in an area with shops, pharmacy, pubs and close to Mardyke arena.